The Mat-Su Valley is a large area spanning over 23,000 square miles! 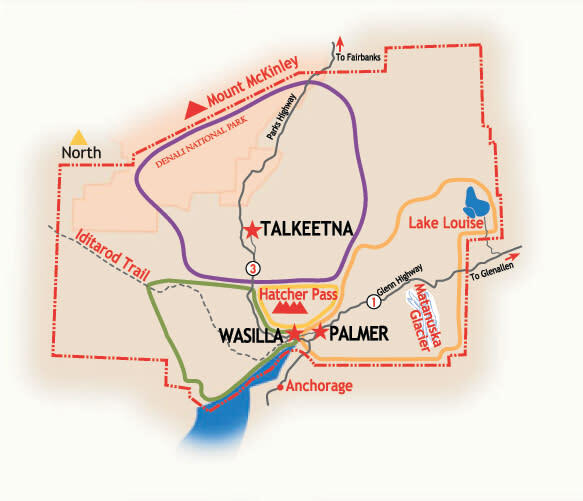 The map on this page is color-coded to represent the distinct destination areas of the Mat-Su Valley. These areas include: Glacier Country, Gold Rush Country, Lake Country, McKinley Country and Off the Beaten Path. The color of each area corresponds with a different region of the map to help you plan your Alaska vacation in more detail. Just choose a region to learn more about the area and what there is to see and do. A mileage chart is also available to give a better indication of the distances between our regions and other highlights throughout the state.